I was lucky enough to be paid to review Audley End a few months ago, and at the weekend, we had the pleasure of visiting another English Heritage property for the same purpose: Wrest Park. To be honest, we visit these wonderful properties up and down the country anyway. We have been members since we first married ten years ago. Reviewing another one of their location wasn’t too much trouble at all, we probably would have been there anyway. …than with a trip on a lovely autumnal day for a spot of lunch, and a lot of fun in the grounds of a gracious pile, and a run about the grounds at Wrest Park. Upon arriving, its a bit difficult to drag the kids away from the playground that greats you opposite the visitor centre, but don’t hang about, there is far too much to see to spend too much time here. We managed 20 minutes at the end, and we didn’t even go in the house. The extensive grounds include lawns, a pavilion, a long lake, a cave, an Orangery, a bowling green house and that playground. The only disappointment in the day was the choice of hot food in the cafe; but we went out to eat and found The Raven at Hexton, just up the road was rather good, so we weren’t wholly totally upset….look at my dessert – well worth the trip out! There was so much to see and do in Wrest Park, we didn’t manage everything in the time we were there…. The Bowling Green House kept the kids entertained for a while constructing replicas of some of the attractions within the gardens…Stunboy made the Archer Pavilion, and the orangery was turned into a wedding by Chatterbox – complete with couple at the front! 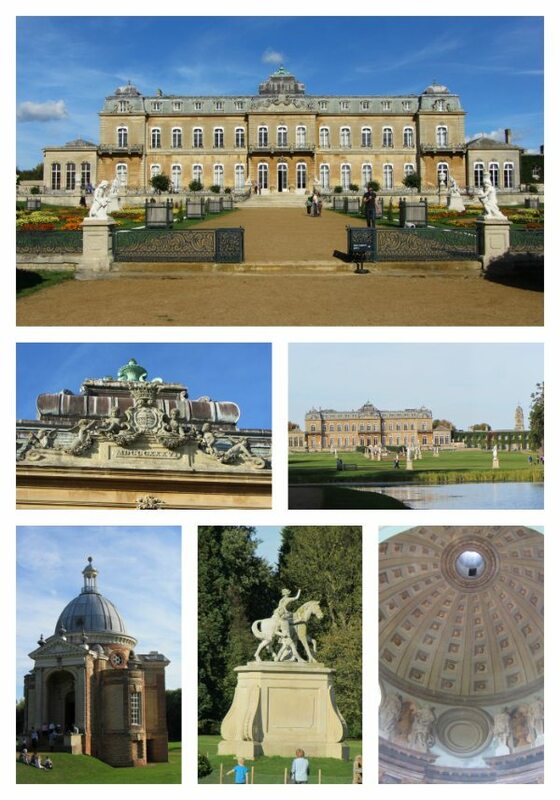 The buildings themselves in Wrest Park are beautiful – made even more compelling by the beautiful weather…. The sunshine also meant that the gardens, which are being restored in a 20 year program, looked wonderful too…. One always needs somewhere to roll in a park right? Hills, replica pavilions within the playground, you name it, we roll on it! We were disappointed that, unlike in Audley End, there were no bikes allowed in Wrest Park. However, problem solved when we found out the scooters were! Finally, there was a bit of time for silliness in the sunshine…. An amazingly enjoyable day which the kids will remember for a long time…and thanks to this poster on the wall as we left, they are already asking to go back…..
For more information on joining English Heritage visit www.english-heritage.org.uk. Such a fantastic day out! Wrest Park looks like a stunning place to visit with lots to see and do. Your photos are beautiful and I hope your little girl had a great birthday. Thanks for linking up and sharing with Country Kids.